Pitting the two consumer staples giants against each other as investment candidates. With dozens of billion-dollar consumer brands between them, Procter & Gamble (NYSE:PG) and Kimberly-Clark (NYSE:KMB) engage in their most fierce rivalry on the baby care aisle. The Pampers brand, which is P&G's biggest franchise, fights year after year against Kimberly-Clark's Huggies for the global market share lead. Procter & Gamble is on the winning side of that battle lately, yet the company as a whole is growing at a much slower pace than its key competitor. But which stock would make a better buy for investors right now? Let's take a closer look. Sales growth excludes acquisitions and divestments and is on a constant currency basis for the past complete fiscal year. Data sources: Company financial filings and S&P Global Market Intelligence. Kimberly-Clark has its larger rival beat in the key operating metric of organic growth. Since it strips out the effects of foreign currency swings and brand divestments, this one figure best captures overall demand. The matchup isn't even close. P&G's organic growth fell for the second straight year to just 1%. Kimberly-Clark's expansion pace is down, too, but has been a much healthier 5% lately. Look beyond that headline number and the picture tilts even further in Kimberly-Clark's direction: Sales volume has been steadily positive for the company even as Procter & Gamble's volumes have declined. P&G managed a slight turnaround on this front last quarter, but has yet to produce the string of volume gains that would suggest a broad growth rebound. On the other hand, P&G is proving more adept at wringing efficiency gains out of its business. Costs are down sharply over the last two years, and management has identified billions of additional cuts that it aims to employ through fiscal 2018. 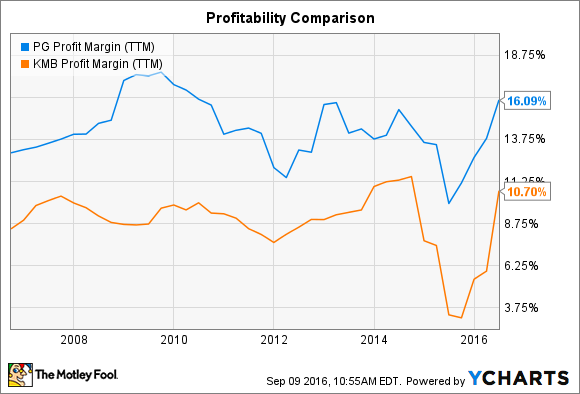 PG Profit Margin (TTM) data by YCharts. As a result, it enjoys consistently higher profitability. That gap is likely to increase in the coming years, given that P&G has sold off many of its slower growing, less profitable brands. Direct cash returns make up a large part of a shareholder's total return with stocks like these, since companies that produce consumer staples tend to generate predictable profit streams in good times and bad. Here, the matchup is a bit mixed. Kimberly-Clark has shown a stronger penchant for dividend hikes, while P&G prefers to focus on stock buybacks. P&G's recent dividend news has been disappointing for income investors. The payout improved by just 1% last year and by 3% the year before, which in each case was the lowest raise in well over a decade. P&G's annual dividend raise since 2003. Data source: P&G financial filings. Buoyed by its faster growth pace, Kimberly-Clark delivered 5% dividend raises in each of the last two fiscal years. On the other hand, P&G is spending a mountain of cash on buying back its own stock. The company is on pace to send $70 billion back to shareholders -- mostly through buybacks -- over the next few years. That represents an incredible 30% of its current market capitalization, and is only possible because the company is selling off big chunks of itself, including through divesting its Duracell battery business and its Coty beauty line. However, cost cuts and brand divestments can't offset sluggish growth forever. Thus, a P&G investment only makes sense if you believe the company will engineer a pivot back to market-beating growth after over two years of underperforming. The payoff would be significant in this case, as sales growth and profit gains would likely leap past rivals. A successful Kimberly-Clark investment, in contrast, requires less guesswork. It offers the same healthy mix of sales growth and above-average dividends that shareholders have enjoyed for years. In my view, that reliability makes Kimberly-Clark the more attractive bet right now, given how cloudy the operating picture is at P&G.